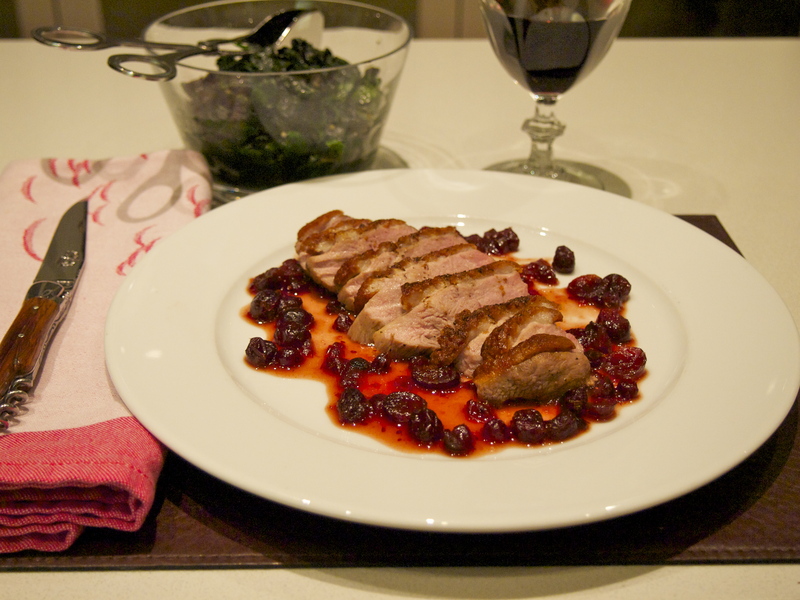 Many people are intimidated to cook duck at home but in fact it’s one of the easiest game and poultry dishes to tackle. Unlike chicken which needs to be completely cooked through but still remain juicy, duck can be served medium or medium rare. I prefer the breasts to be pink and the legs to be slow cooked and falling off the bone and both cases are very easy to achieve. 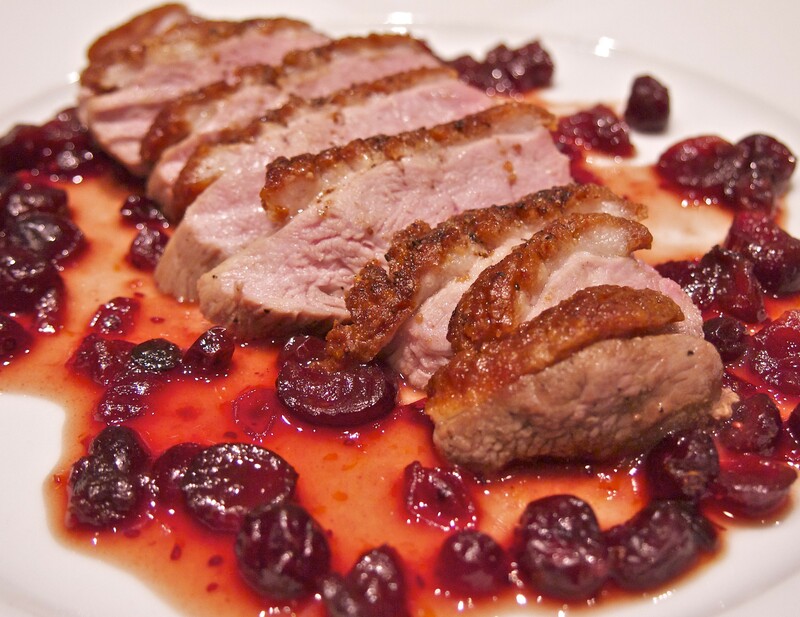 Duck is viewed as being a rather unhealthy meat to indulge in due to the high fat content but the fat is mostly in, or just under the skin and much of it is rendered away during the cooking process – the actual meat of the duck is quite lean. In any case recent studies show that duck fat has some surprising health benefits. The U.S. Department of Agriculture’s National Nutrition Database lists duck fat weighing in at 62% unsaturated fat and 33% saturated fat. So it’s a much better choice than cooking in butter, which is 50% saturated fat. Plus, duck fat has a huge 62% of the heart-healthy unsaturated fat and the only other fat that can compete with that is olive oil. There must be some truth to this as the Gascony region of France whose population consumes the most amount of duck fat in the world has the lowest rate of heart attacks – 80 in every 100,000 (middle-aged men) compared to the Unites States at 315 (middle-aged men) in every 100,000. So next time don’t feel guilty ordering that duck dish. As the French say, everything in moderation, including moderation! Preheat oven to 190C. Using a sharp knife score the skin of the duck breast in a diamond pattern making sure that you don’t score into the flesh. Season well with salt and pepper. Heat an oven proof fry pan over medium heat and add a small drizzle of olive oil, about half a teaspoon. 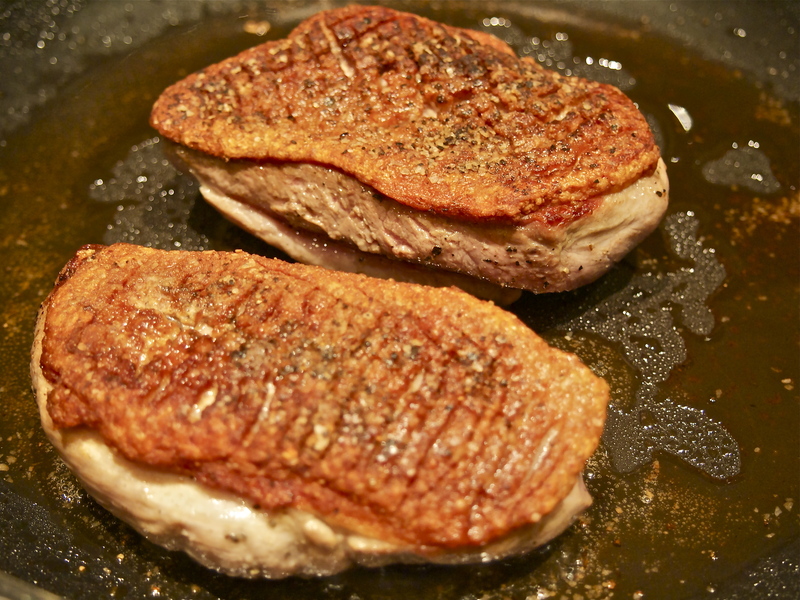 When the pan is hot add the duck breasts, skin side down and cook without turning for 8 minutes. The skin after this time will be golden and crispy. The breasts will release quite a bit of fat so you’ll need to spoon this off a few times as it cooks (don’t throw the rendered fat out, you can use it the next time you roast potatoes). Turn the breasts skin side up and transfer pan to the preheated oven and cook for a further 5-6 minutes for medium. To make the sauce add the rest of the ingredients to a small saucepan and let it infuse off the heat for about 10 minutes. 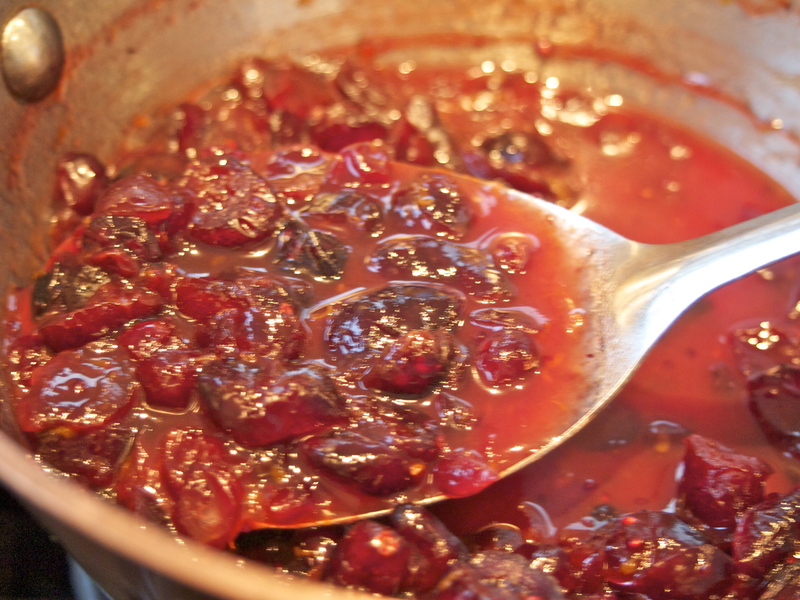 Turn the heat on under the pan and bring to the boil, reduce the heat and simmer for 5 minutes or until the sauce is thick and syrupy. Take the duck out of the oven and let it rest for 5 minutes. 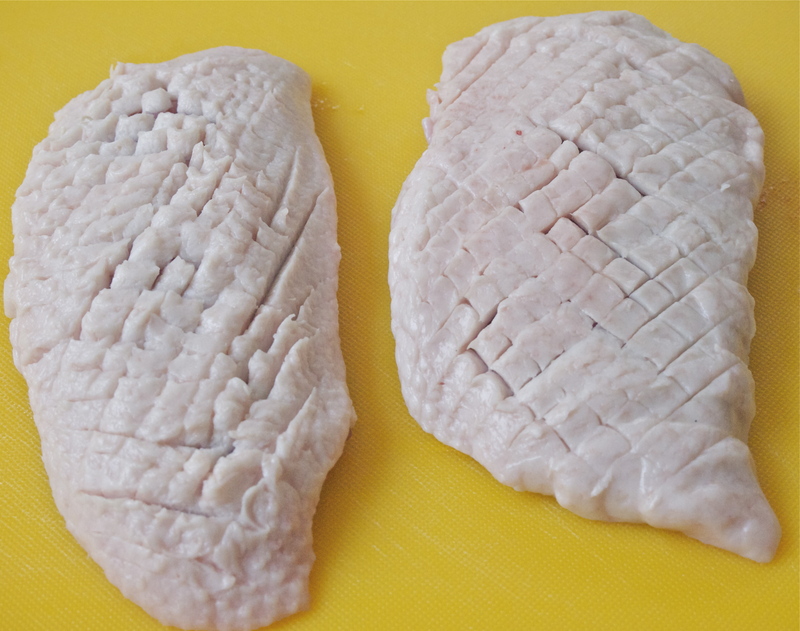 Cut the breast in thick slices on the diagonal and serve with the sauce. I cannot believe it. I thought that cooking Duck would be the most difficult thing in the world. This looks so easy – so easy that I will attempt to tackle this tonight! I am so excited.